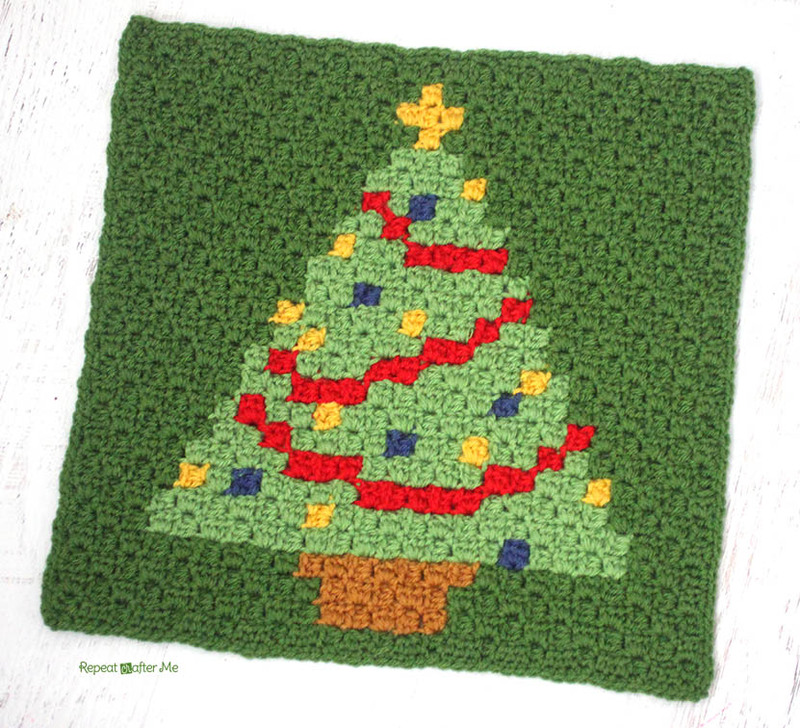 The Christmas Tree is square number 2 of 9 total squares that are going to make up a Crochet Christmas Character Afghan! You can find Square #1 (Santa!) HERE. 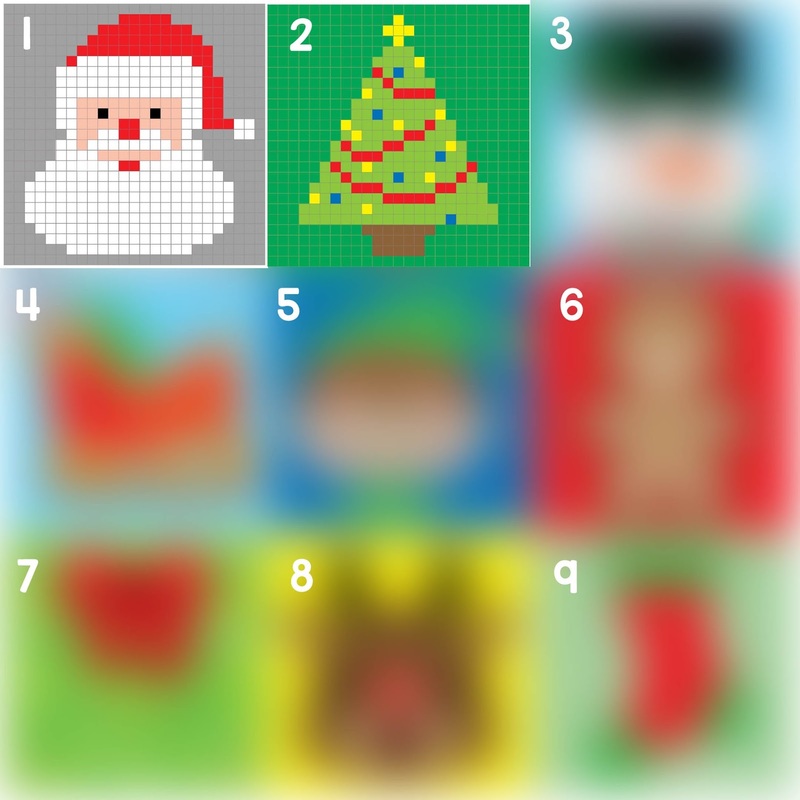 As I finish each square, I will post the graph and reveal the next character/image in the blanket. Feel free to work along with me! After all the squares are complete I will sew them together and add a border. By Christmas (but hopefully soon before) we will have ourselves a fun holiday themed afghan! I am using the corner-to-corner (C2C) technique. You can see my first C2C graphgan HERE that has a how-to video. 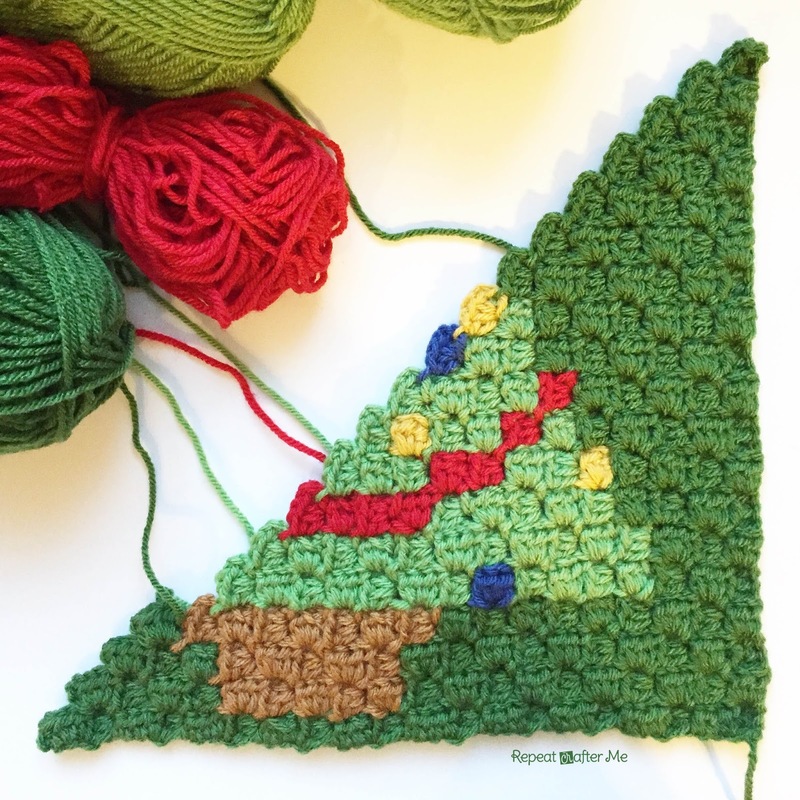 But I am told that most people have success learning how to make a C2C graphgan by following THIS VIDEO DEMONSTRATION by The Crochet Crowd. Each pixel graph in my blanket is 25×25 pixel squares. I used a size F (3.75mm) hook and worsted weight yarn. For this particular square I used Lion Brand Vanna’s Choice in Kelly Green for the background, Fern Green for the tree, Scarlet red for the garland, Mustard yellow and Colonial Blue for the lights, and Honey for the trunk. 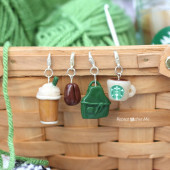 You will want to get two skeins of both green colors and one for the rest of the elements. You will begin to notice that a lot of the colors will repeat and be consistent/coordinating throughout all 9 squares. If you are using the same yarn I am, you may want to stock up on Lion Brand Vanna’s Choice in Kelly Green, Fern Green, Dusty Green, Scarlet Red, Honey, Toffee, Mustard yellow, Little Boy Blue, Black, White, Pink, Cranberry (dark red), Fisherman or Beige, and Terracotta orange. When you finish the graph you will want to make a nice SC border around the entire square. Make SC+chain2+ SC in each corner. I used a dark green (Kelly Green) for the background but you can use any color you’d like. This square is quick to work up, but there are a lot of color changes which unfortunately means you will have a lot of ends to weave in. 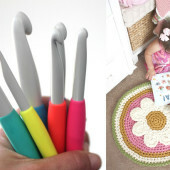 Use the ends to your advantage by “faking stitches” and seeing the ends in so your red garland is connected in the corners. 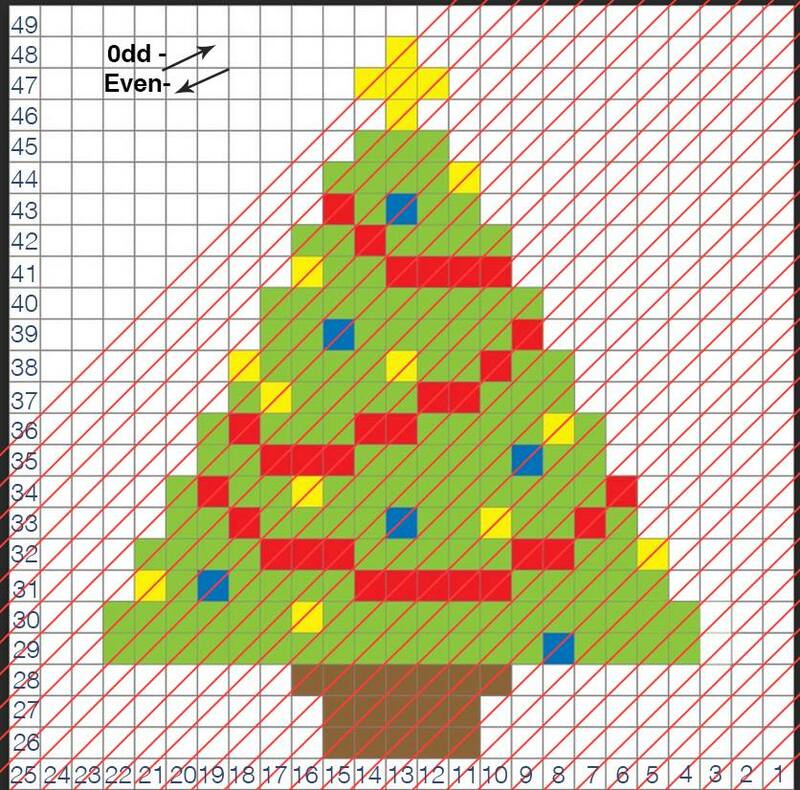 Here is the Christmas Tree written pattern for the color changes thanks to a fellow crocheter and RCM follower, Jennifer Heath-Rogers! Stay tuned for square #3! Thank you, Sarah. The white background is fabulous! 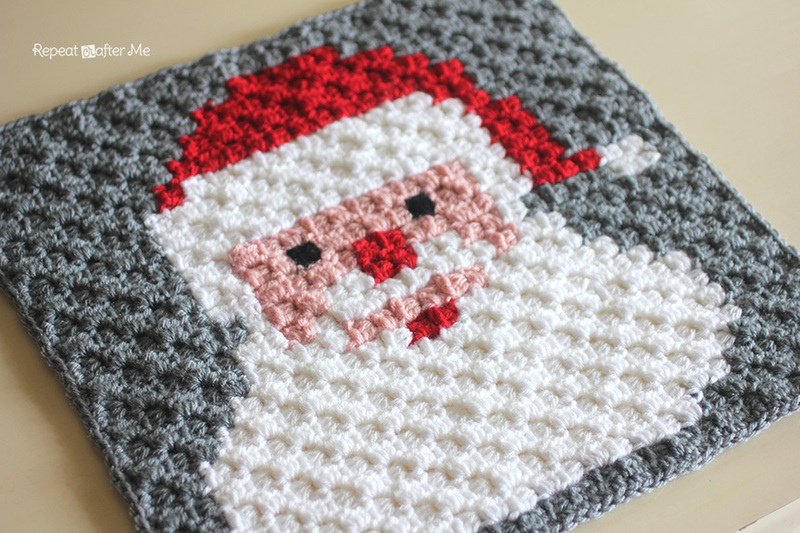 I love the idea for these Christmassy squares Sarah! Great idea to make Christmas squares. This one looks great and the first square is fabulous. I am not familiar with "Use the ends to your advantage by "faking stitches". What does this mean? How is it done? there is a video, it may help you! This is lovely! I am very tempted to make it for Christmas. Thank you for sharing your hard work. I love this and want to make the afghan but I am not familiar with "faking stitches". Can anyone tell me how that is done? RE: Faking Stitches – I think what she means is that as you're weaving in your ends, use the tails to cover over any gaps left behind. I am currently making a heart (just the outline, not a filled in heart) using this method and I have a boat load of gaps due to the way the diagonal lies and the colors change. Therefore, I will not just hide my tails, I will use the tails to fill in those spaces to make it look like its continuous. I hope that makes sense (and I hope that was what she was intending!). And to Sarah and Jennifer – I am so grateful for the written out instructions. I did that with the heart graph I'm working on and I can tell you it is very convenient and thoughtful of you to give us those counts in advance. Thank you!!! 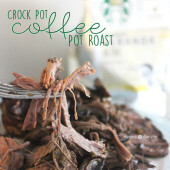 Thank you for providing the green print friendly link for downloading! If we want to use the same colors you are for the entire blanket, how many of each should we buy? Gracias por el patrón, me sirvió mucho, ya tejí el molde del árbol de navidad y me salio tal cual al original, estoy contenta. ahora voy a tejer el molde de la cara del Viejo Pascuero. GRACIAS. Finished the first two. How often do you post. Ready for #3. LOL. Can’t wait!!! P.S. I LOVE the new site design! How much yarn of each color do we need to have? I like the idea of the written pattern, but when I did the tree it all went crooked…is there a mistake in the written pattern…just asking. Can anyone explain how to change colours on this pattern. Should I trim and then weave in threads afterwards or follow the colour change video. The latter doesn’t seem to work. When will #3 be posted? would love to get the rest of these pixels. Reindeer for sure. Was getting but for some reason haven’t gotten the rest. Please send me the one for the reindeer. Thanks. A lot of thanks for your whole work on this blog. My daughter take interest in working on investigations and it’s simple to grasp why. We all hear all about the compelling way you produce vital steps on the web site and therefore welcome participation from other people on this area plus our favorite daughter has been learning a whole lot. Have fun with the remaining portion of the year. You’re doing a splendid job. How do we make one of these squares in the size of a small blanket? These are great. Are there any more squares yet besides number 1 and number 2 if so how do I get to them. Pretty Good. 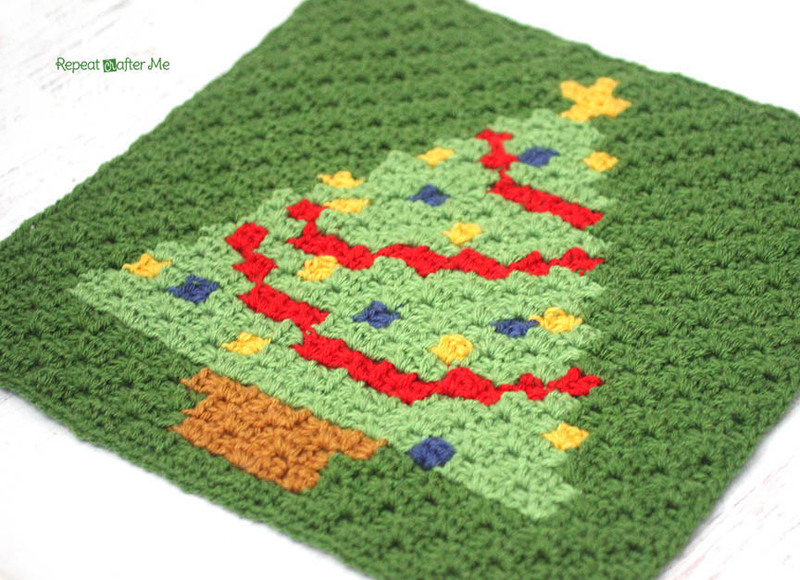 Thanks for sharing with great crochet christmas tree pixel square. Thank you for all of your patterns and videos. I honestly love this site. The way the Hollywood actors smile is just mind-blowing and if you are also dreaming to have the same then get ready for Hollywood Smile Dubai. Montreal International Clinic has the best and the multinational team of dentists with immense experience who will get your teeth treated with no pain and side effects. It’s dec 22. 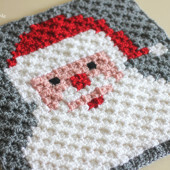 All i can get are santa &tree.If you could e-mail me pic’s of other sq’s I can reproduce with little granny sqs. What I need are pics of the pic on the sheet with all the little sqs and the colors on the sqs like a graph..I’v had several people and videos try to teach me c2c.. I’m 77 w catarects in both eyes. 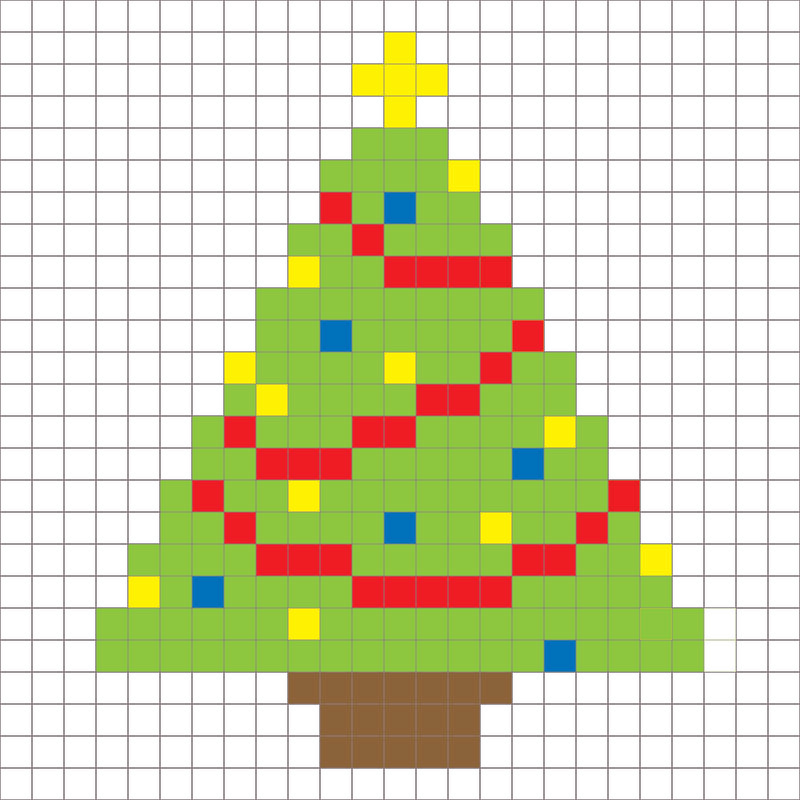 But i can make pics making small granny sq i copy from graphs and sewing them all together.. Please i would really appreciate if you could do this fo me. God bkess you. I read your post and I appreciate your efforts. The information that you share in the above article is very nice and useful. An all the things that you share with people are very nice. Thanks for this Blog.